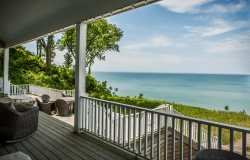 3 BR 2 BA cottage in Union Pier, MI - hot tub open all year! Property Size 1,247 sq. ft. Welcome to Red Bird Cottage in Union Pier, MI. Red Bird Cottage is a single story 3 bedroom 2 bathroom home just two blocks away from beach access. Best of all, the hot tub is open all year 'round! As you enter through the front door into the living room you will immediately be impressed with the immaculate condition of the home. The cozy and comfy living room offers a flat screen TV and wood burning fire place. Well cared for and tastefully decorated, each of the three bedrooms has a queen sized bed. Bathroom one is located off the cute and well appointed kitchen. The second bathroom is connected to the master bedroom and boasts a walk in steam shower. The outdoor space the home offers is impeccable. Red Bird Cottage boasts a large screened in porch with plenty of seating. Screened in porch leads out to side deck with hot tub. Red Bird Cottage lives up to it's name with ample yard space and plenty of wild bird life to observe. Only a two block walk to beach access!